250 pages, 8.5" x 11"
Rich in anecdotes and humor, Bill Werber's Memories of a Ballplayer is a clear-eyed memoir of the world of big-league baseball in the 1930s. Originally published by SABR in hardcover in 2000 and in paperback in 2001, the book is still in print, but now also available as an ebook. Bill Werber's claim to fame is unique: he was the last living person to have a direct connection to the 1927 Yankees, "Murderers' Row," a team hailed by many as the best of all time. Signed by the Yankees while still a freshman at Duke University, Werber spent two weeks that summer of '27 on the Yankee bench to "gain experience"—and was miserable and lonely, ignored by everyone. After graduating in 1930, Werber was back with the Yankees, but he was soon sent to the minors for seasoning (including a stretch with Casey Stengel). He returned to the big leagues in 1933 and was promptly traded to the Red Sox. A fleet-footed third baseman, Werber also played for the Athletics, Reds, and Giants, leading the league three times in stolen bases and once in runs scored. He was with the Reds when they won the pennant in 1939 and 1940. Werber played with or against some of the most productive hitters of all time, including Babe Ruth, Ted Williams, Lou Gehrig, and Joe DiMaggio. 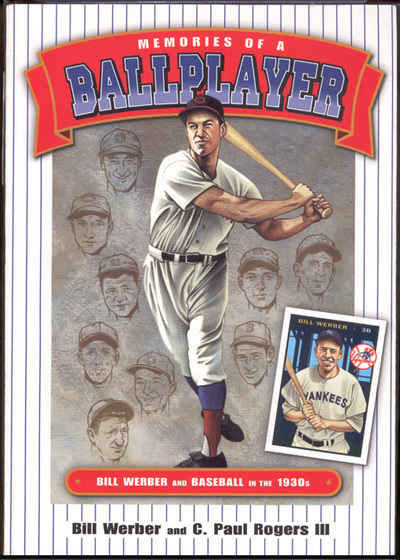 Bill Werber played major-league baseball from 1930 to 1942. He then had a successful career as an insurance executive and passed away in 2009 at the age of 100, then the oldest living former major-leaguer. C. Paul Rogers III is a professor at the Southern Methodist University School of Law and a SABR member since 1990. He is chair of SABR's DFW Hall-Ruggles Chapter in Dallas-Fort Worth, Texas. SABR members, get this e-book for FREE! E-book: Click here to purchase the e-book version of Memories of a Ballplayer for FREE from the SABR Store. Available in PDF, Kindle/MOBI and EPUB formats. Paperback: Get the paperback edition of Memories of a Ballplayer from the SABR Store ($10.99 includes shipping/tax). E-book: Click here to download the e-book version of Memories of a Ballplayer for $6.99 from the SABR Store. Available in PDF, Kindle/MOBI and EPUB formats. Paperback: Get the paperback edition of Memories of a Ballplayer from the SABR Store ($20.99 includes shipping/tax). For 40 years, SABR and its members have led the way in publishing the best baseball historical and statistical research. Our publications program is shifting to take advantage of new methods of publishing. Not only will we continue to publish new books like CAN HE PLAY? A Look At Baseball Scouts and Their Profession (released in December 2011); OPENING FENWAY PARK IN STYLE: The 1912 World Champion Red Sox (released in May 2012); Red Sox Baseball in the Days of Ike and Elvis: The Red Sox of the 1950s (released in September 2012) and Detroit Tigers 1984: What A Start! What A Finish! (released in December 2012), which showcase the best efforts of SABR's members, chapters and committees, but new technology makes it possible for us to bring out-of-print titles like RUN, RABBIT, RUN: The Hilarious and Mostly True Tales of Rabbit Maranville (released in February 2012), GREAT HITTING PITCHERS (released in March 2012), NINETEENTH CENTURY STARS (released in August 2012) and Batting (released in January 2013) back again. Books will be available in digital formats as well as paperbacks produced by "print on demand" (POD). Stay tuned throughout the year for new (and old!) titles that we'll be adding to the SABR Digital Library. SABR members will get discounted rates for all Digital Library publications. If you're not a member, click here to join SABR. To view all books in the SABR Digital Library, visit SABR.org/ebooks. This page was last updated October 31, 2017 at 9:54 pm MST.